6 - 80 Ounce Buckets with Lids. Made in the USA, Lead Free, Food Safe and No BPA. Free Shipping!!! Brilliant Colors: 1 each Pink, Lime, Red, Blue, Orange, Green, and Yellow on this purchase. 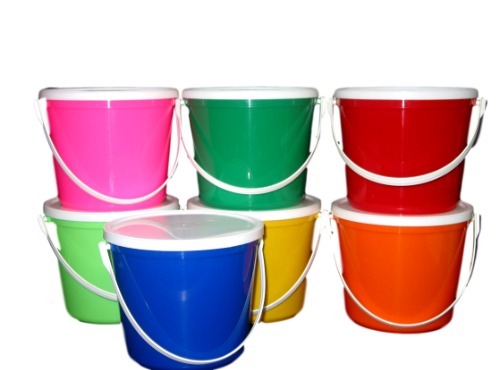 Buckets are durable, tops in quality, dishwasher safe (top shelf), microwaveable and very easy to clean. Lid creates air tight bucket. A real asset to Home and Garden, Toys and Hobbies, Team Sports and Agricultural Uses. Bucket measures: 5 3/4" Tall x 6 1/2" Top and 5" Bottom. Requests, Special Orders and Silkscreening available: Call Toll Free 1-877-275-0052 with your questions or concerns.